Subcompact SUVs are among the fastest growing vehicle segments today. While a typical budget small crossover is rife with compromises (the Nissan Kicks doesn’t even offer AWD), the luxury subcompact segment pushes a bit back toward comfort. But even within that segment, there are some shortcomings. For example, the Mercedes-Benz GLA and BMW X2 are both underwhelming and underpowered. It is in this context where the all new 2018 Jaguar E-Pace shines. 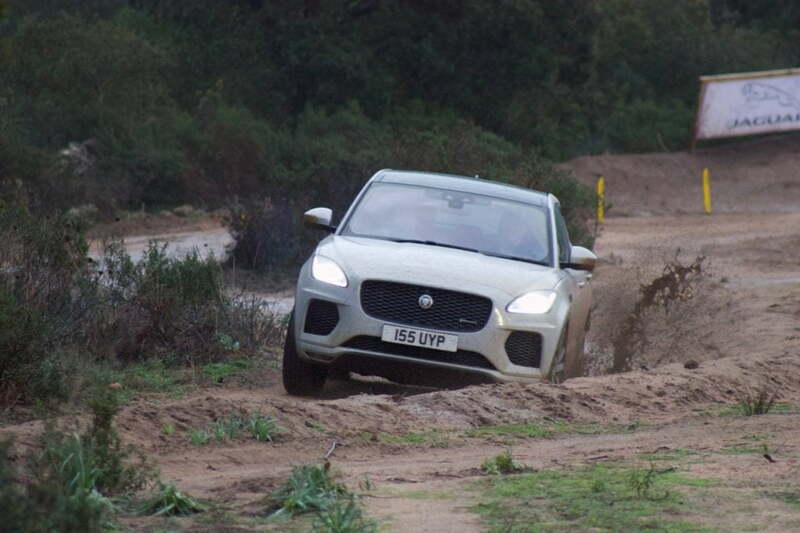 The smallest SUV from Jaguar doesn’t feel like it, as it adds some flair and excitement into this segment. The sharp looks are backed up by brisk acceleration and advanced multi-surface AWD tech. The “E” in E-Pace signifies its place within the lineup, just as the smallest Jaguar sedan is the XE. 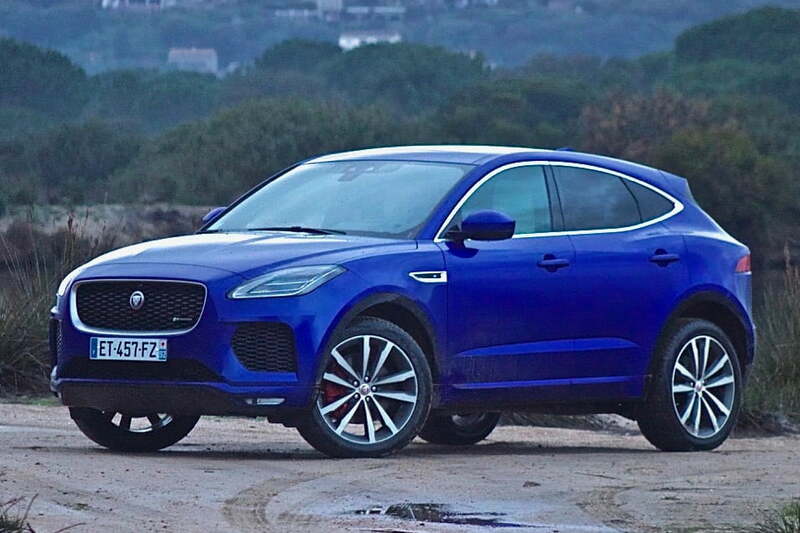 But the E-Pace actually bears a stronger resemblance to the F-Type sportscar. The bulging hood, sleek headlights, and crisp fender lines hint at the F-Type. Even the rear end, with its sloping rear window that finishes with the wedge-like rear deck evoke the stunning F-Type. Finally, the Caesium Blue paint of our test car “pops” in any light. 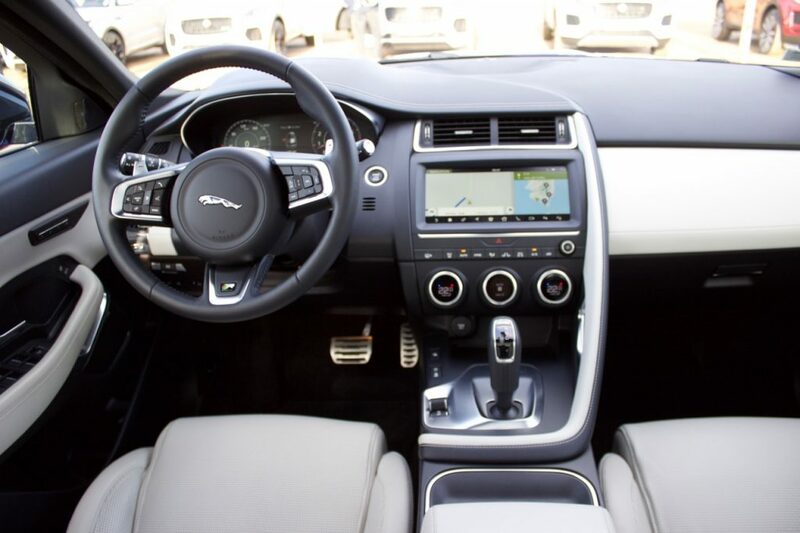 The similarities to the F-Type continue in the cabin, especially in the handle-like divider that runs down the passenger side of the center stack. Just like the F-Type, it features “gun-handle”-style shifter, emphasizing the driver-focused cockpit layout. Trims for the E-Pace are S, SE, and HSE. The base S comes with well bolstered leather seats, 5 USB ports, and a full array of cubbies and compartments, including a pocket that is right-sized for a tablet device. We drove the SE, which came with heated seats with power bolstering, a power, head-up display, a massive panoramic moonroof (which does not open), and a 4G Wi-Fi hotspot that can support up to 8 devices. Our test model also featured the large 10-inch color touch screen. This infotainment system was relatively easy to use, and featured large icons and a “dock” and the bottom of the screen to go from menu-to-menu. The system was somewhat buggy at times, and would take a moment to respond. There is a bit of a learning curve to the system, and it does not provide Apple CarPlay or Android Auto. But the E-Pace does provide an actual volume knob—not always a guarantee in 2018. There are two engines available in the E-Pace, both of which are 2.0-liter turbocharged inline-4 cylinder engines. The boost from the turbo can be adjusted, resulting in the two outputs. The PS250’s engine makes 246 horsepower and 269 pound feet of torque, while the PS300’s engine puts out 296 horsepower and 295 pound feet of torque. Power is sent through a 9 speed automatic transmission to full-time all-wheel drive. 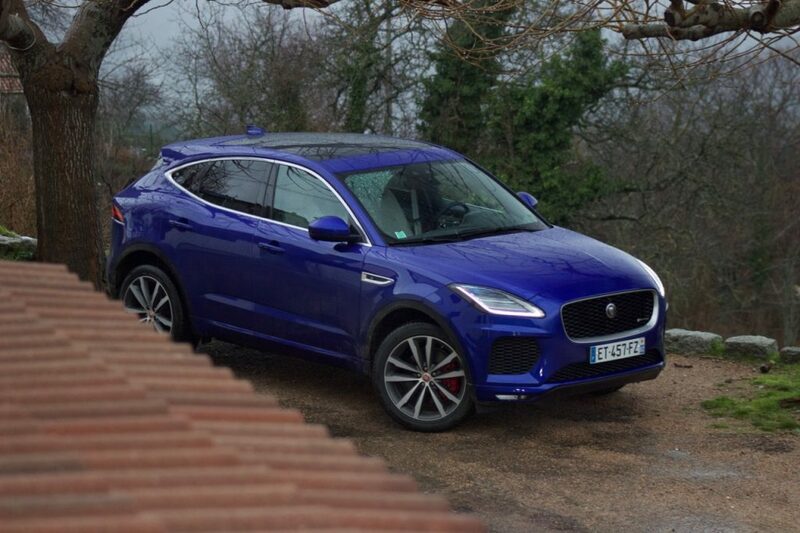 While AWD system is capable enough, the E-Pace is also available with active driveline system, which features torque vectoring. As opposed to some crossovers that rely on the ABS system for traction, the active driveline can divvy power to any of the four wheels, individually. This makes it exceptionally capable. Even sloshing around in mud, the system can put power to the rear outside wheel of the turn, giving the drier serious command in many different conditions. Down in the center console, to the left of the shifter is the Drive Mode Selector, which adjusts steering feel, throttle response, shift mapping, and power distribution for the AWD system. It provides Normal, ECO, Rain/Ice/Snow, and Dynamic drive modes, the latter really tightens up the driving experience. There is a nice even weight to the steering, something akin to BMW M-series vehicle in Sport mode. The turn-in and radius are very tight, which will bode well for city driving. The suspension will bottom out on serious potholes, but overall, is well suited for both rough and smooth pavement. It has all the hallmarks of a crossover designed for actual driving enthusiasts. The 2018 Jaguar E-Pace starts at $38,600. The S trim starts at $40,900, and the SE starts at $43,500. That’s competitive, but like most vehicles in this segment, the price can escalate quickly. Most models will likely cost around $50,000 to $60,000. Jaguar has stated that its goal with the E-Pace (aside from sell a bunch of cars) is to draw new shoppers to the brand. Considering the way the subcompact luxury SUV market is growing, that shouldn’t be a problem. In fact, the E-Pace has the performance credentials to even pull some customers away from BMW. If you’re looking for a small, upscale crossover that’s actually designed for the driving enthusiast, the E-Pace beckons.